Old Bus Photos » T. R. T. B. This bus looks very smart in the Dark Green and Cream livery of T. R. T. B. unfortunately it did not look all that good in the new livery of Turquoise and Cream of Teesside Municipal Transport. This drastic change of colour scheme apparently happened because of the formation of Teesside County Borough in 1968. Thus causing Middlesbrough Corporation, Stockton Corporation and the Tees-side Railless Traction Board to join together to form Teesside Municipal Transport. Another snippet of information gleamed during research was that fleet No. 34 a ‘Leopard’ similar to above was written off after an accident in 1975. One good thing was that due to another local government shake up 6 years later the Turquoise and Cream livery was soon changed to Green and Jasmine which sounds much better. It’s curious that even the best body builders occasionally built ‘ugly ducklings’. IMHO this looks very strange, almost as though it has been made up of parts that were in stock for other purposes. The windscreen looks fabulous on double deckers and would probably have looked well on a coach. But here, the roof doesn’t match up with the windscreen. The side windows (and the rear window) just look old fashioned. And the front elevation isn’t enhanced by the heavy bumper or the trim around the Leyland badge (why did they do it?). But for all that, it exudes a certain charm and the first livery style helps it. A delightful rarity. You pays your money as the saying goes. The best looking ‘bus’ versions of the Leopard? for me it had to be the Alexander ‘Y’s even the ‘Corporate Image Experts’ found it hard to make them look bad, as for coaches, that’s a far harder choice. Whatever else it is, that vehicle highlights just how interesting the industry was. I can see elements of Roe, Plaxton, Alexander and even East Lancs in that Frankenstinian monster. The colour scheme helps – I thought both the schemes which followed were insipid, but the fact remains it’s a bit of a monster. Four of these handsome vehicles were delivered to the TRTB in 1965. They were specifically built for works services and have B.E.T type windscreens. In 1974 S304 as mentioned above suffered a frontal impact RTA which saw it written off. 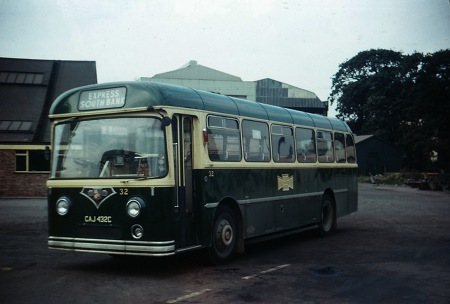 The other three were all painted in the later Cleveland Transit livery and were transferred to Saltburn depot to cover the refurbishment of the eclectic collection of Bedfords acquired with the acquisition of Saltburn Motor Services. These Leopards were long lasting with the last one not being disposed of till 1982. At the risk of sounding controversial I have to say that I find this bus to be of very pleasing appearance indeed, not ashamed to look traditional. If there is anything that jars a little its the top of the windscreen which admittedly doesn’t look quite right. Other than that I think its a delightful vehicle, and the lovely livery is the icing on the cake for me. Although the windscreen is double curved, in a similar manner to the BET screen, this is actually a different screen. PRV and Roe used these screens on several vehicles, both double and single deck during the 1960s, but very few of them really suited the lines of the bodywork. The inward taper of the sides didn’t match the profile of a double decker, and it doesn’t work particularly well on most single deckers as well. The differences are the flatter top of the BET screen, and the BET design was always two piece. The BET screen also fits the lines of the bodywork rather more neatly, and I rather suspect that these PRV/Roe screens were in fact designed for vehicles that were just 8′ wide. Despite what others have said, I quite like this Leopard apart from the front dome, which has a touch of Cyclops about it. Hi Peter, thanks for the correction. I have adjusted my records accordingly. Cyclops eh? Lol! Later on from about 1971/2 these buses received some small numeral blinds which were positioned adjacent to the destination screen on the near side. This made them look even odder. Only one TRTB double decker survives today and this is it. JVN 40E was one of the last half cab/rear entrance buses to be delivered to any NE Operator in 1967. 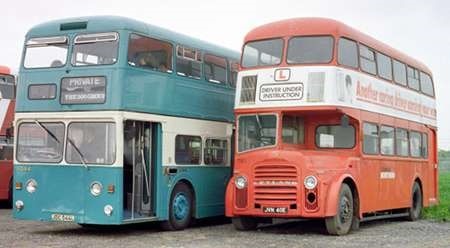 It is seen here in Stockton on Tees alongside the preserved TMT Fleetline JDC 544L after its recovery for preservation in 1995. Currently JVN 40E is in storage awaiting restoration.